God showed up and we are changed! Please have a look at the photos on our Flickr site and the slide show on vimeo. Katie and Todd in traditional Congolese wearAs per usual, Katie and I have been encumbered by a few unexpected twists and turns. In the last month we’ve spent almost as much time away from our beloved Congo as we have within its borders. 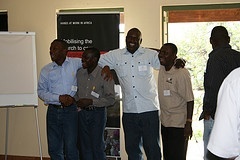 The first time was for the Hands at Work Celebration in Zambia, April 11-16. The most interesting part about that trip, for me, was the opportunity we had to spend time with some of our Congolese friends away from their familiar surroundings. Traveling to another country for a week is almost unattainable for many of these people even though the border is a mere taxi ride away. It put us on a level playing field in some ways. We were no longer the only ones feeling out of our element and we were no longer the only ones that needed a translator. 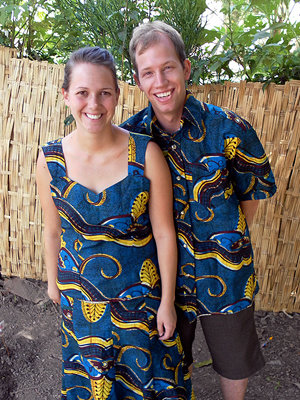 That week away impacted our relationships in a special way that was not lost upon returning to the Congo together. Then, a few weeks ago, Katie was feeling weak and uncomfortable in numerous ways. We found a doctor to come to the house to do some tests and found that she had contracted malaria. Some friends in South Africa encouraged me to bring Katie back there for a short time to allow her to be near a reliable clinic in case her sickness escalated. When we left, we didn’t say goodbye to any of our friends because the decision to leave happened so quickly. We felt like we left our relationships, and our work in Congo, unresolved. Being pulled away without warning uncovered our true feelings to return to Congo as soon as possible. 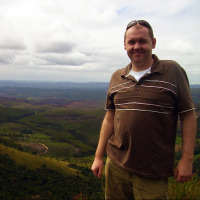 Leon Evans, a good friend of Hands and senior pastor at Zion Christian Centre in the UK, wrote about his recent trip to Zambia with Hands at Work on his blog. "Is this the way to Amulo?" Sounds like a really annoying song that was out (again) a few years ago. Actually, it was what I found myself saying quite a lot in a car whilst bouncing on roads, that had more potholes than road, just outside Kitwe in the Copperbelt mining region in central Zambia. My wife, Allison, and I had just left a conference hosted by Hands at Work, an amazing organisation - actually, more of a family - who support projects all across sub-Saharan Africa that are actively reaching and serving widows, orphans and vulnerable children. Now the conference was over and we were off to Amulo for a community stay: the chance to stay with a local household and spend 24 hours with a family. A couple of weeks ago Lauren Lee and I had the opportunity to attend Hands at Work in Africa’s Regional Celebration in Zambia. Each year these celebrations are a time of gathering together Hands at Work international volunteers and the community-based partners from all over Africa to encourage each other and celebrate all that God is doing throughout the global Hands at Work Family. This year, from 13 to 16 April, Hands had its biggest Celebration ever in Zambia with nearly 200 representatives from over 40 communities in Africa as well as representatives from Canada, the United Kingdom, Germany, and the United States. The theme of the Celebrations this year was, “Going Deeper.” The vision of Hands at Work is the local church in Africa effectively caring for the orphaned, widowed and the dying and unified in this mission with the church outside Africa. All of the different sessions focused on Going Deeper in relationship to make this vision become a reality. The celebration kicked off with a message from Hands at Work founder George Snyman who focused on Going Deeper in our relationship with Christ. He asked the question, “Why do you do what you do?” The motivation for caring for the orphaned, widowed and dying should come out of a deep love for Christ, a thankful spirit for what He has done for us, and a willingness to share that sacrificial love with others through service. An excerpt of Ephesians 4 was given to everyone at the start of the Celebrations to read. I think it speaks directly to the purpose of these regional celebrations. In early April a group of local church leaders, friends of Hands, and Hands at Work staff and volunteers got together at the Hub just outside White River to talk about Who, What, Where and How we are. Sensing God's favour on the day, the Hands at Work team were up at the crack of dawn to set up. By the time guests arrived, lively chatter and upbeat music filled the air. George Snyman, Hands at Work founder, spoke first and said that he hoped the day would give everyone a good glimpse of the family's handiwork. George showed the child mortality rates of the countries that Hands is working in (see a PDF of his PowerPoint slides linked below) and asked of each person: "What would God do with His available resources if one out of five of His children did not reach the age of five?" Then a second question to chew over: "According to the indicators, it is life endangering for a girl to go to school in sub-Saharan Africa. How can this be when Africa is the most evangelized place on the planet?" "Every month there are 180,000 new orphans. The number of orphans due to HIV/AIDS continues to grow and grow," he went on to say. "There is no time to be quiet when 6,000 children will walk back to their huts as orphans. We cannot tell them about Christ alone, we need to show them Christ's love through our actions." Soon after the annual Hands at Work South Africa/Swaziland Celebration, hosted at the Hub in White River from 29 - 31 March, 20 of us set out - in a variety of transport modes (some flew, some endured 45-hour bus rides!) - to Zambia. The Zambian leg of the Celebration, 13 - 15 April, was cause for a large family reunion: Hands at Work volunteers and community-based organization workers from as far as Nigeria, the DRC, Malawi, Zimbabwe and from across Zambia came together for three days of much singing, dancing, eating and sharing of stories, encouragement and starting of new friendships. Now back at the Hub, we've enjoyed a slow Easter break and even celebrated a family wedding! Hands at Work family members from across Africa shared stories that had us laughing out loud at times, in tears at others. We talked, too, about our plans to roll out the Walking with Wounded Children programme in collaboration with Petra College: A phenomenal programme that aids care workers - often wounded themselves - to deeply care for the orphaned and vulnerable in their communities. And, of course, we took a lot of pictures! We'd love to share them and our stories with you. Sukai lovingly cares for a group of vulnerable children in Mulenga, ZambiaAt 12 years old, Esther was left alone to care for her ailing mother and younger brother. Esther's mother, desperate like many other women in the urban slum of Mulenga, including Esther's grandmother, had turned to prostitution to earn an income to support her children. Esther knew of no other way to make ends meet and was likely to follow in her mother’s footsteps. 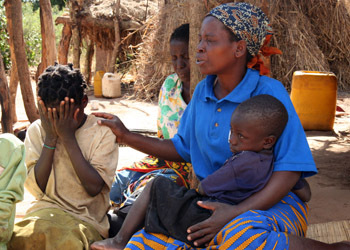 Had it not been for Mulenga Breathrough Care Group, Esther wouldn’t have had hope of a future. Mulenga Breakthrough Care Group started with a heart to care for the most vulnerable in their community. When Esther and her family were found by care workers from Mulenga Breakthrough Care Group, both her and her family were supported and loved. They visited often, bringing encouragement, and they enrolled Esther back into school and helped to nurse her mother. Unfortunately, Esther's mother passed away. But before she did, because of the love demonstrated by this committed group, she herself found solace in the acceptance of the Christian faith. Esther doesn’t have it easy now, though. As a maturing young woman, with the history of a prostituting family and a younger brother to care for, she could easy fall to the temptation of quick, easy money. But it’s not too late for Esther. With the love and care of Mulenga Breakthrough Care Group, she can overcome the obstacles she faces. Hands at Work will once again be hosting Regional Celebrations and our International Country Office Meeting this year. Last year was a huge success! Vision and heart were imparted and shared amongst a larger audience then ever. It was a great time of connecting, encouraging and celebrating. Read more about it here. If you are interested in attending or helping fundraise for this chance to acknowledge and appreciate our Community Based Organisations and Service Center Field offices in each of these countries for the incredible life-giving work they do then please contact us at info@handsatwork.org. Save the dates, and start saving to travel! Hands at Work will once again be hosting four Regional Celebrations and our International Country Office Meeting in 2011. Last year was a huge success. Vision and heart were imparted and shared amongst a larger audience then ever. It was a great time of connecting, encouraging and celebrating. Read more about it here. In early April this year we began celebrating with our communities and family across Africa: First in South Africa, then Zambia, on to Mozambique and finally in Nigeria in late May, covering all the regions in which we work. This involved a large representation of our care workers and office staff coming together for a time to be refreshed, to build relationships, and to re-establish the vision, core values and the roles which each of us play. Now is the Time was the theme of the celebration and a strong Word shared throughout the conference was, "How beautiful are the feet of those who bring good news." We just finished our first regional conference last week, and it was a huge success! For many the highlight of the South Africa/Swaziland conference was Thulile sharing her story of helping children. In November 2009, five brothers and sisters under the age of 12 huddled themselves in their stick and mud hut on a deserted hillside in rural Swaziland and watched their sick mother die. Their father had died in the same hut a year earlier, leaving the children to look after their sick mother for months before she passed away. They had not been attending school, had no school uniforms or books, and now they were alone without even a single day’s food. After two weeks fending for their lives, a neighbor found the children eating mud on the bank of a river to keep their stomachs full. He went to speak with Asondle Sive Bomake (ASB), a hands at work partner CBO in the area. After the neighbor spoke with ASB, they assigned Thulile to visit the children. When Thulile first went to see the children they ran away. Thulile said, "They didn't want to be around other people at all." 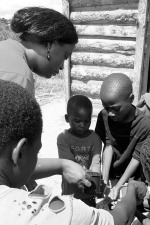 Hands at Work in Africa is asking you to join with us in 40 days of prayer for orphans. This is only a suggested guide. This time of prayer will coincide with our multiple Hands at Work Regional conferences that are happening all over Africa. If some faithful members can meet daily, so much the better, but if not, do not let that discourage you. Pray alone if necessary and meet whenever possible. Know that many across the globe are joining you daily, together in agreement in prayer. Gather 2 or 3 (or more) people in a home or a church or anywhere and the Lord will be with you and hear your prayers. Matthew 18:20, "For wherever two or more are gathered in my name, I am with them, in their midst." The most important part is to commit to praying daily! In the past we have done two conferences, both in South Africa. An Africa conference with our African service center partners and an international conference with our African partners and many international churches and donors as well. This year instead of having the conferences in just South Africa we will be holding four regional conferences that will be open to anyone interested in attending. The Hands at Work family is growing at a rapid rate which means that it is becoming increasingly difficult to get everyone to South Africa. This means we can bring the conferences closer to home for the Service Centres involved, also allowing our international visitors flexibility and possibly allow them to attend in the country of their interest. In the past we have only been able to have a very small number of community based organizations (CBO) representatives present. By holding regional conferences it will also enable greater CBO participation and give more people exposure to the vision of Hands at Work. We are excited about the new opportunities that hosting regional conferences will bring. All are welcome to come and be a part of the different regional conferences. If you are interested in attending or helping fund the conferences please contact us at info@handsatwork.org. Hands Canada celebrated their first ever National Conference & Banquet in Calgary on November 21, 2009. From the humble beginnings of the five people that Lynn Chotowetz asked to help out a couple of years ago, we had over 120 people at our evening banquet. They came from Parksville, Victoria, Vancouver, Calgary, Edmonton, Saskatoon, Major, Winnipeg, Toronto and Masoyi. Hands Africa's first ever international volunteer, Maggie from Toronto, was in attendance. 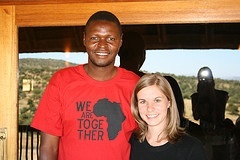 “We are together!” This phrase rang constantly through the weeks of March 18th-29th, when Hands at Work in Africa hosted its 2009 Africa and International Conferences. Representatives journeyed from seven of the African countries that Hands currently works in to gather together for their only annual meeting as a family. Representatives from the international offices partnered with Hands and many other donors, church partners, friends and volunteers were also present. Because the entire Hands family can only gather together once a year, the conferences are an important time for the organization—to bring everyone up to speed on the inner and outer workings of Hands, to remind everyone of the standards and goals we are working for, but mostly to remind those who have devoted their lives to serving others in their African communities that they are not alone in their efforts. Our International Conference is a time when we gather together in one place with our Church and Organisation Partners, African Service Centers, and International Country Offices to fellowship, build relationships, hear about the work being done and set the tone and work plans for the upcoming year. Mark this time down in your calendars to be with us. Planning is already underway for the 3rd annual Hands at Work International Conference to be held 4 - 7 April, 2008 at the Hana Lodge, South Africa. The international conference is a place where Hands at Work partners and project leaders from around the globe gather to share ideas and plans and to encourage and minister to one another. This year’s agenda promises new opportunities for learning and collaboration among our partners. As usual, the International Conference will be preceded by the 4-day African conference gathering of Hands at Work leaders from projects across Africa. Project leaders spend time learning from one another, communicating with Hands at Work staff, and, especially, being ministered to. Contact Hands at Work for information on sponsoring a project leader to attend the African conference.